WLH (personal file) 15 Nov 16 granted 10 days leave. (War Diary: 2 OR [un named] proceeded on leave) There is no mention in the personal file as to where he went. It is possible that he returned to England for a few days. Transport by ship from French ports was regularly available. The 7 km long Vimy Ridge lies in a NW-SE alignment and across the top is a further escarpment—the Lorette Spur lying on a more east/westerly alignment. Between them is the Souchez River and the town of Souchez. The Germans took the area in August-September 1914 and so controlled both ridges. The Spur was eventually captured by the French in Sept 1915 and handed over to Commonwealth forces in March 1916. The village was completely destroyed. The Ridge itself had been attacked on several occasions by British and French troops with severe losses. It was then handed to the Canadians who offered to take iit. Vimy Ridge rises gradually from west to east with the eastern edge being 60 meters above the plain beyond. It had huge strategic value as an observational platform for the Germans. It was in sheltered areas of the lower western side of the Ridge that the Canadians trained for the attack to take the ridge. 29th Oct 6th IB Order 2953 'No 67882, Pte. 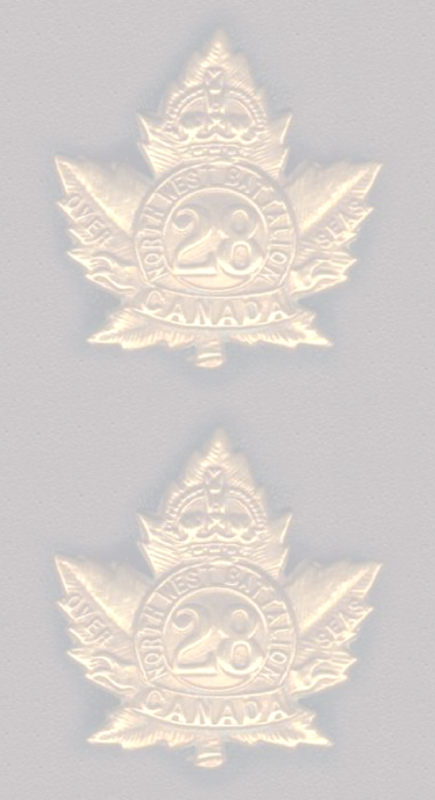 ELLSWORTH YOUNG, 25th Canadian Infantry Battalion was tried by Field General Court Martial on the following charge:- "When on Active Service, deserting His Majesty's Service"
'The accused absented himself while proceeding to join his Company in the trenches, and was arrested 13 days later at ABBEVILLE, wearing Corporal's stripes and an Artillery Cap Badge. Training. Great care was taken to train everyone. No longer were the lower ranks expected merely to follow orders; now they were given the opportunity to understand the plan and how it would unfold. Through aerial reconnaissance, photography, raids into no-mans land, and on German trenches, details from scouts and snipers, extensive intelligence was obtained. 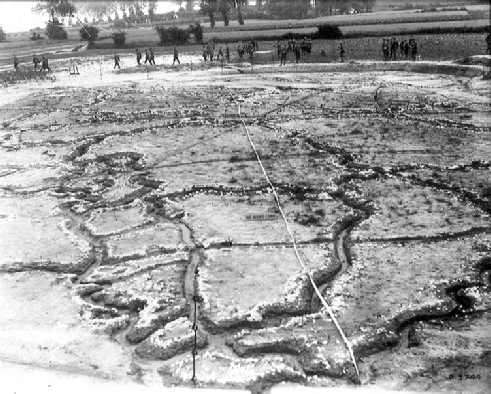 Models of the trenches and craters, barbed wire and gun emplacements they were to encounter were laid out in a area on which training took place. Tapes were laid to identify the terrain through which each section and company would advance. Through the worst winter of the war, the training went on. Men were trained to undertake the responsibilities of men above them and beside them and even to use German weapons that could be turned once the trenches were taken. While the training was progressing, men also spent time in the trenches, keeping the Germans at bay. 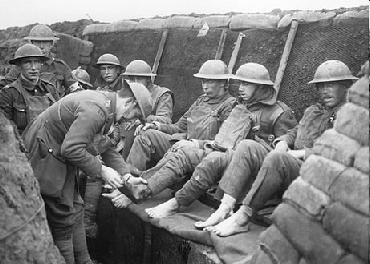 Trench Foot was a serious condition caused by prolonged exposure to cold, wet and unsanitary conditions. Men standing in trenches deep with water were particularly vulnerable. If untreated it led to gangrene and eventual amputation. Officers were under strict instructions to inspect the feet of the troops regularly and to issue whale oil as a preventive measure and ensure that all men carried a second pair of dry socks. A Battalion could use 10 gallons of whale oil a day. Needless to say, a gift of spare socks from home was very welcome. 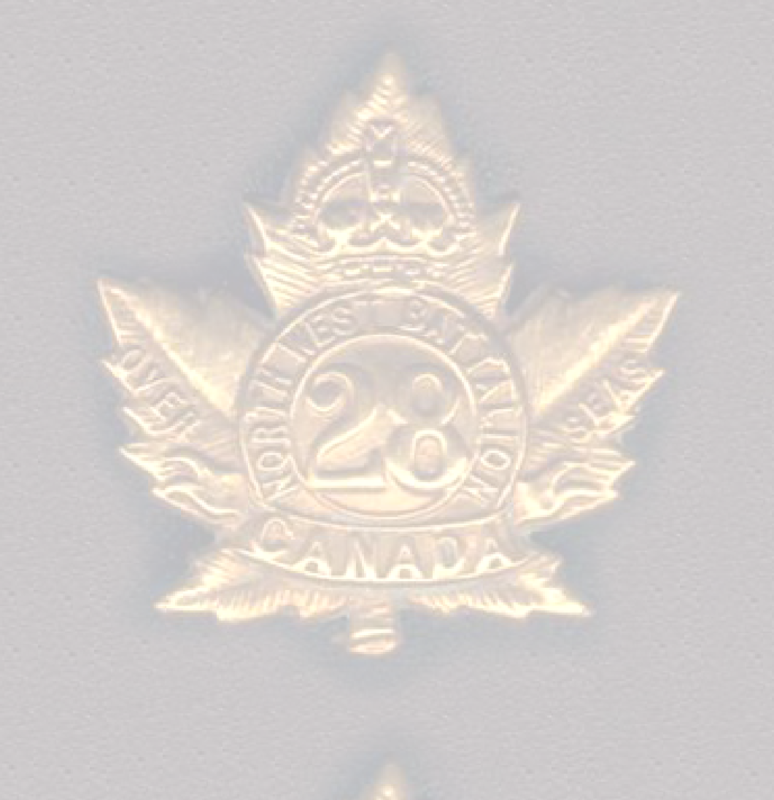 The remains of a Canadian soldier buried at one of the cemeteries at Souchez, were exhumed and now are entombed as the Unknown Soldier in Ottawa. Tunnelling: Although the 28th Battalion was not directly involved in the creation of the many miles of tunnels under Vimy Ridge, they were expected to use them when the Battle began. Tunnelling had been going on in this area since medieval times as much of rock was chalk and easily cut. But during the war each side dug successive tunnels under the others’ and exploded mines in them to cause incredible damage. There were many different types of mine used depending on the objective: destroying enemy areas above or below ground, or burying them in debris; creation of a crater with a high rim that could be captured and exploited to advance the front line. Another type of explosion was designed to collapse a low tunnel and thereby, create a new trench or sap into the enemy area or into no-man’s land. To this day the area is riddled with tunnels and craters from both armies; some are lost; others are open to the public and still others are being or have been excavated. Still others remain too dangerous to enter. Tunnelling in preparation for the battle had several purposes. Troops could use them to move to their jumping off points protected from whatever was going on above. A major plan for the battle was for troops to ‘leap-frog’ towards the objectives on the field. For example a Brigade would attack to the first objective and stop. Another Brigade would pass through and attack to the next objective and so on. Tunnels were dug but not opened until the last moment when they were exploded and the men could exit directly onto the battlefield. The tunnels were then put into use to bring up supplies and ammunition as they were needed. Also relieving troops could be brought up in relative safety. Tunnels also allowed the wounded to be brought back from the field. Although these were often separate from out going tunnels, both for expediency but also morale purposes. All main tunnels had piped water, electric lights from generators and telephone lines. Chambers were cut into the walls for headquarters, stores, dressing stations and communication centres. The longest tunnel, the Goodman Subway opposite La Folie Farm was 1.2 km in length and the largest of the caverns was Zivy Cave which could hold an entire battalion of 1000+ men. The Zivy Subway led to the battlefield. On 20 March the Battle began. In the relative calm of behind the lines, the Company Quartermaster Sergeant, acting under the Regimental Quartermaster (often referred to as Q) was responsible for all the Company’s supplies: weapons and ammunition, blankets, food, water, post or mail, uniforms, boots, whale oil, billets and the movement of all of this when and where required. He had to keep track of it all including salvage and repairs. He also had control of the company rum ration—issued morning and evening or before attacks. It warmed, relaxed and when necessary dulled pain of injury. In active combat situations, the CQMS probably stayed with the wagon lines and did not personally bring up supplies and ammunition but in a fast moving battle such as this, it may have required him and his staff with ever lengthening supply lines, to do whatever necessary to keep the supplies coming. Keeping the fighting men supplied had, of necessity, to take precedence over everything else. 28th Bn War Diary: Order No 162. 9 Supply arrangements. An advance dump of reserve drums (Lewis Gun ammunition) set up in the Brigade Dump at Zivy Cave. ‘C and D Companies will also be responsible for detailing parties to bring up from Brigade advanced dump and Battalion dump (which will be established in the vicinity of the CEMETERY ) any supplies needed.’ There can be little doubt that WLH saw a great deal of this battle, very close up.